To create a new report, Navigate to Expense accounting under Compliance. Once there, click the green Create a new report button. The Create a new report modal will take you through 3 easy steps (2 if you are a publicly traded company). 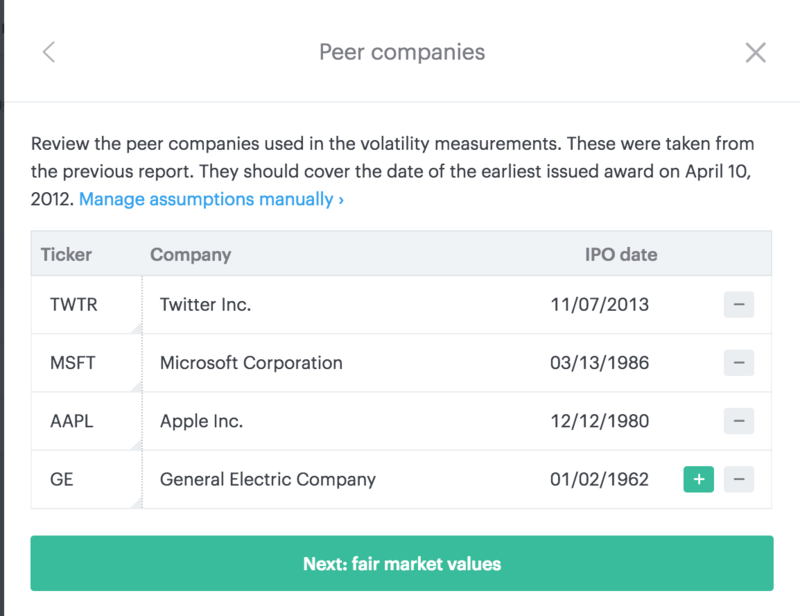 Select the green Next: Peer companies button to move on to the first step. Step 1: Enter the public peer companies. We require you to include at least four unique public peer ticker symbols. You can add more by clicking the green + button. We typically see clients using the public peer companies from their 409a report. However, if you are unsure which companies to use, you may find this article helpful. Once done, select the green Next: fair market values (or Next: report period for public companies) button to move to the next step. 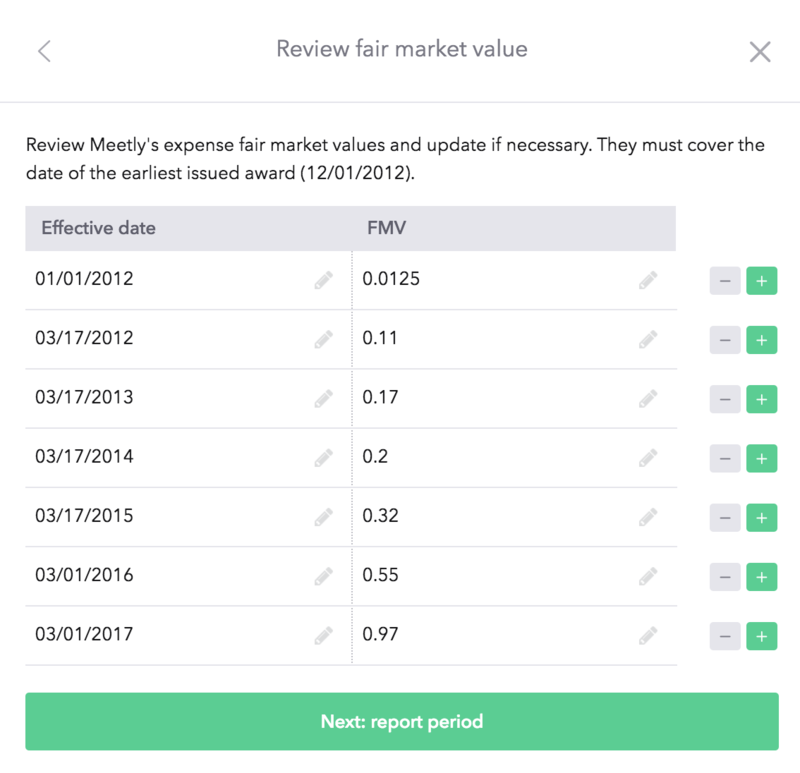 Step 2: Review your Fair Market Values (private entities only). The values shown on this step come directly from your 409a page. If you add any additional values on this step, the additional values will show up each time you create a new report, unless you delete all reports and start over. You will be unable to move onto the next step if you do not have a fair market value listed as of the grant date of the earliest issued award. 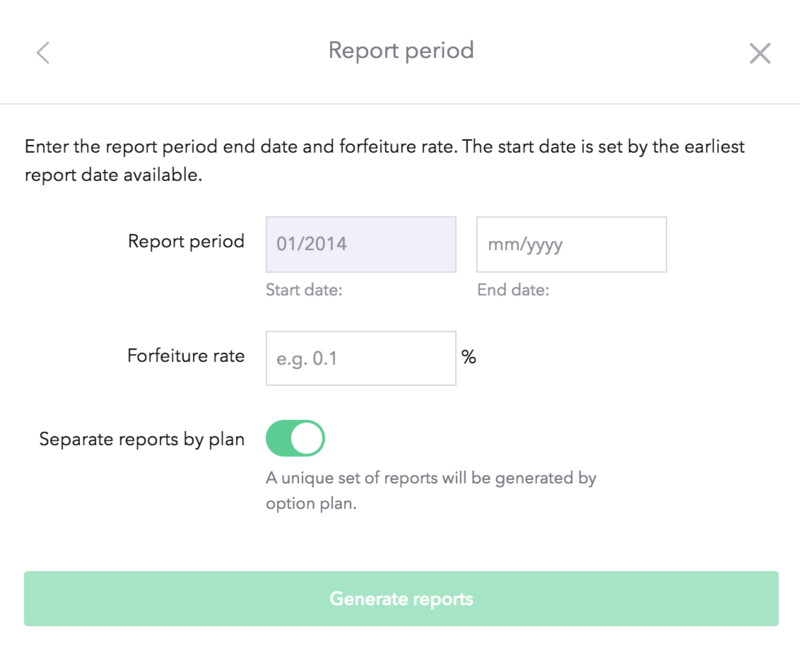 Step 3: Enter your reporting period, forfeiture rate, and indicate if you would like the reports separated by equity plans. You will first indicate the End date of your reporting period. It should be noted that the Start date will always be filled in for you as Carta's software knows where you left off. If this is your first time generating the expense report with Carta, the start date will be the date of grant of your earliest issued award since this is the very first day you will need to start recording SBC expense. If you have generated expense reports with Carta before, the Start date will be the next month from where you left off in the last expense report. For example, if you generated a report last month for January 1, 2015 – December 31, 2015, the Start date will be January 2016 when you generate the next report. Next, you will need to input your forfeiture rate. For companies wishing to adopt ASU 2016-09 which requires entities to record forfeiture as they occur rather than estimating and applying a forfeiture rate, you may use a rate of 0% here. Carta’s software is capable of recording forfeitures as they actually occur when our clients use this 0%. For other companies wishing to continue predicting forfeitures, you may enter in your estimated forfeiture rate. For more assistance in calculating the forfeiture rate based on the historical cap table data, please find this article here which walks you through how to download the forfeiture rate report and how to interpret the data. Finally, ensure the green toggle next to Separate reports by plan is on if you wish to have different expense reports for each equity incentive plans listed under Securities >> Equity awards >> Manage Equity Plans. Generating reports will take approximately 15 minutes to an hour depending on the size of the cap table. When the reports are finished generating, you will receive an email with a link to download the reports. If you have any questions, contact support at support@carta.com.